Such a beautiful "soup to nuts" creation! You've given me just the inspiration I need to make something out of that beautiful Hushabye fabric. Better late then never John. Thanks for sharing this cute little quilt that I know will be cherished and loved for many years to come. What a fun charm pack to play with, love the colors and prints. Thanks for sharing! Lucky Mrs QD to be able to present such a lovely gift for the new babe! Great quilt! Your quilt is beautiful! I just got 3 Hushabye charm packs in the mail today. Great inspiration for me to get playing! Thanks for sharing the story behind the quilt. great when you can start and finish a quilt in a week. Love the fabric too! Beautiful quilt! It's amazing what a little time pressure can do! Your baby quilt is beautiful!! I love those fabrics. I'm sure the Mom was thrilled with her gift. Hope things slow down a bit for you, so you can get to more sewing. Love & blessings from NC! Way to go! A beautiful quilt indeed. It's absolutely beautiful! I bet she loved it, probably the best gift she received. A quilt is very special and this one is so pretty it will be used for a lifetime surely. Good job! Of course the Mom loved it! Beautiful fabrics and the quilting looks fantastic! Of course she loved it! This is gorgeous. Beautiful! I just got the same fabric in a jelly roll and some additional yardage for a baby quilt. If mine turns out half that nice I'll be a happy camper! Oh that is so, so pretty! It's wonderful! And I'm so impressed with how quickly you got it done! Hey - I want a quilt dad too if he's going to make great quilts like this! all my husband does is play with wood!! Great job! The colors on this quilt are perfect and the machine quilting looks great too. What a wonderful accomplishment! Isn't it great to know that you have the skills to whip up a fabulous shower present in less than a week? Great job on the quilt! I'm sure the baby will love it for a long time. wow! you made this beauty in 6 days!? that's so amazing! you are so talented and this baby quilt is such a gem! 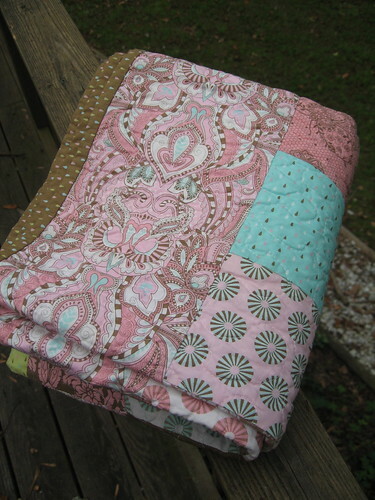 I love the hushabye fabrics and the lovely quilting and the binding is perfect! you rock! I check in on your blog every so often because you have some interesting projects going on. Love the main fabric for this one. Looks great. Lucky baby. What I want to know is this. How did you get the bird in your header to turn out so well? I made one a few weeks ago and it was a disaster. Your progress is always amazing! Can't wait to hear your ideas. What a fun quilt! It looks perfect for a lucky baby. :) You have come a long way, so very quickly-- it is inspiring. Thanks so much for sharing! This is a beautiful quilt John! Isn't Tula Pink just amazing? I haven't seen Hushabye in the flesh yet, but I know I will soon. Cute and FINISHED quilt! YEAH! Beautiful quilt! I recently finished my first quilt top and am ready to actually quilt it but I'm very hesitant about it. I'm sure there are a ton of tips out there, but what do you suggest for a first quilt? Gorgeous !!! Just goes to show that a quilt doesn't have to be difficult to make to be beautiful. I love the fabric you've used. 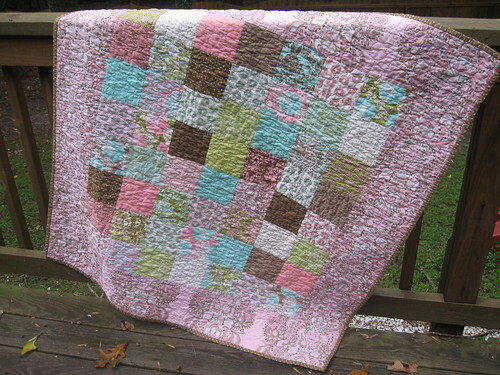 Your baby quilt must have come together in a hurry, but it looks beautiful. 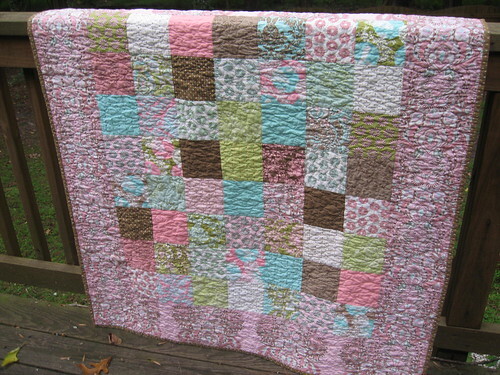 I love it's nice soft colors and the quilting makes it look even softer. I bet the baby would love to cuddle it. I love the fabric you used on the borders. It all came out great! sometimes those simple designs work best. Go you! Now, get finishing some of those other large quilt tops you have lying around - ok?! That is a beautiful quilt. I love your stuff! "soup to nuts"? Never heard that one. That's nice to have a project that pulls helps you realize how far you've come. I was just binding last night and while I didn't finish, I, too, was amazed at how much faster I have become! what a wonderful job! I'm so glad I visited, because I have been shopping the hushabye fabric and now I know how all the fabrics look together in a quilt, with binding and backing! It's so cute too!!! You really have come a long way, I remember reading some of your first posts! What a lucky baby to receive the pretty quilt. I have many grandbabies that would love the puppets and would like to have the pattern. 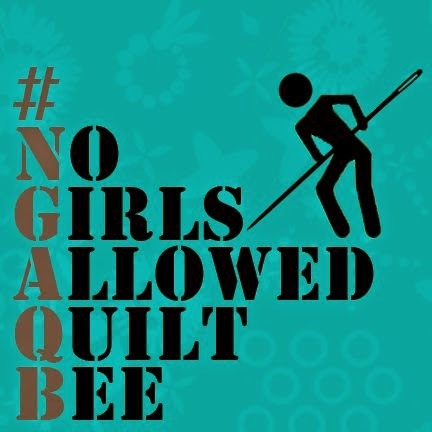 Love your quilt and you blog...I have been reading it for a few months now, and you have great ideas and awesome tutorials...I am so happy to have discovered how fun the log cabin can be! Thanks so much! There is great joy in starting and finishing a project in record time without any major hitches. 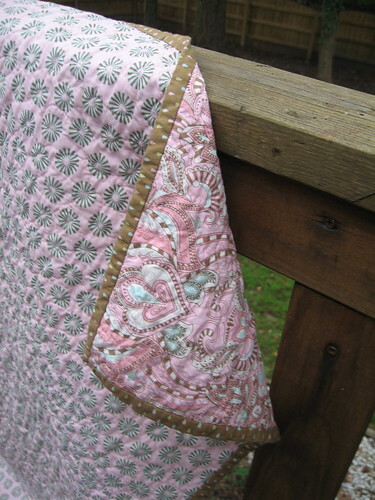 One pucker aside, this is a gorgeous quilt and is sure to be cherished. Thanks for sharing your quilt's story. What a darling quilt...good job on the quilting. I am new to free motion quilting, myself, and I understand that to be something to be proud of. Great job. 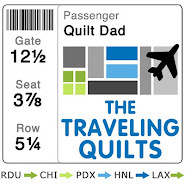 Hey Quilt Dad! I love to read your blog and admire your projects. I have a suggestion for you. I may be a little late but if you haven't heard of Craft Hope before you should check it out. Their current project is making quilts for the homeless children in the Grand Rapids area. I just recently got involved and started with the last project. It is always rewarding to help others in need out and I look forward to making a quilt for them! Have a great day! hushabye.. you really know how to make a new mom happy!!! soo pretty.. i'm just jealous that it isn't mine! I am in love with the border fabric! This is lovely! and I love the story behind it... I'm so impressed that you finished that baby quilt in 6 days (jealous, even!). How did you do it? I need tips!!! Fantastic baby quilt. It is a beautiful quilt. Sometimes the simplest quilts are the best. It's so pretty! Isn't the Hushabye fabric great?